The laser height does not "cancel out". What are you talking about? It is a simple experiment. The height of the observer in the water convexity experiment doesn't get added to the bottom of the boat. Your height changes how much the drop is. At 0 feet the drop is 6 feet at 3 miles. At 3 feet the drop is 1 foot at 3 miles. Whatever you are imagining in your head is clearly wrong. Use the calculator and try to come up with a scenario where we would place the laser dot at 8 feet above the water's surface. How did they get 8 feet? They took the height of the laser and added 6 feet to it. That is all there is to it. You're mixing up 2 things. Of course the observer height changes how much of the boat you can see - Jerad questions in his video why you can see the laser and I dealt with that, if the laser and the observer are both a couple of feet off the ground then you can see it. But don't mix that up with how much the laser height changes. If the laser was 0 feet off the ground then the two measurements would be 0 feet and 6 feet. The laser is about 2 feet off the ground so the two measurements are 2 feet and 8 feet. I have explained above why the difference is the same no matter what the height of the laser is. I've added a blue line to my diagram which represents what you can see. That does vary with height the difference of the laser height does not because the laser is set to be parallel with the ground. Your vision doesn't have to be. So the green line represents a laser at ground level and is also what you would see at ground level. That's the 0 and 6 feet. The red line represents a laser a couple of feet off the ground. That's the 2 and 8 feet. But the BLUE line is what you can see at 2 feet. You don't have to look parallel to the ground - you look slightly down over the curve of the earth so can see more. You are giving me a headache. You have it wrong. That is not the way it works. There is no way to get 8 feet. The height of the laser isn't added to the bottom of the boat in that experiment. The drop in the calculator refers to the drop all the way to the surface of the earth. You are interpreting this wrongly. The height of the laser isn't added to the bottom of the boat in that experiment. The drop in the calculator refers to the drop all the way to the surface of the earth. Yes. Which is 6 feet. So if the laser was at ground level then the laser would hit the boat at 6 feet. That's the green line. But the laser isn't at 0 feet, it's at 2 feet. So the first measurement is (about) 2 feet, the second measurement is (about) 8 feet. The difference is STILL 6 FEET. I did prove that mathematically above. If you don't understand that proof then I'm not sure how to help you. Lets look at this step by step. Assume that the boat is 10 feet high. Lets refer to the earth calculator to what we should be able to SEE. At a 0 feet observer height and a 3 mile distant boat, you see that 6 feet of the boat is hidden, right? 4 feet of the boat are visible. At a 2 feet observer height and 3 mile distant boat, you see that 1 feet of the boat is hidden, right? 9 feet are visible. The laser is the 2 foot high observer, and sees 9 feet visible of the 10 foot high boat. How is it possible to shoot a laser horizontally and hit a mark 8 feet high on the boat? That laser would have to be angled upwards. Because the laser is the red line - the light shines parallel to the ground but that ground curves away, that is what makes the height of the laser appear to rise. But the observer is the blue line - he looks slightly downwards across the curve of the earth and sees more of the boat. The blue line represents the lowest point of the boat he can see. Basically, the laser is parallel to the ground, the observer's view is not. Now you appear to just be saying that at 3 miles the 2 foot high laser sees 9 feet of the boat, but that the boat is tilted enough by the curvature of the earth that the laser dot reaches 8 feet in altitude. I think we can all see your argument for what it is now. 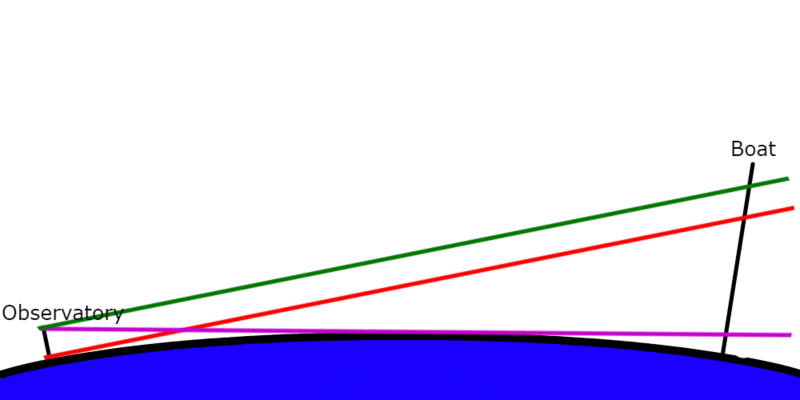 The laser is not focused on the horizon, it is parallel to the ground. Indeed. Unfortunately Tom doesn't seem to understand the difference even though I've drawn a diagram which explains it. And you can see from the blue line that yes, the laser could hit the boat lower down but only by angling the laser downwards. Red line - laser parallel to the ground/observer; both at 0 feet. Green line - laser parallel to the ground at 1 feet. Do you understand now, Mr. Bishop? You are talking about the purple line, we are talking about green line. I see what you are trying to argue, but I don't believe that the boat would be angled away by the curvature of the earth enough to cause that effect. The angle is very miniscule. Measuring the amount that objects angles away isn't even the stated goal of the experiment in the video. Regardless, the second experiment does not use lasers and is based on observation. The amount of distance hidden is again exactly identical to a calculation of drop on an earth curve calculator if the height were zero. Well, maybe you shouldn't just believe and do some calculations. Well, you'll have to tell that to the earth curve calculator. To be honest, I haven't checked the maths. This really isn't a matter of belief, you can work it out. I will try to do so. I haven't looked at the 2nd experiment in as much detail. I will have a look. For speed I've assumed that AC = 3, the same as the distance travelled. This is not quite correct, 3 is actually the distance around the arc of the circle but the angle is so small that the error is negligible. 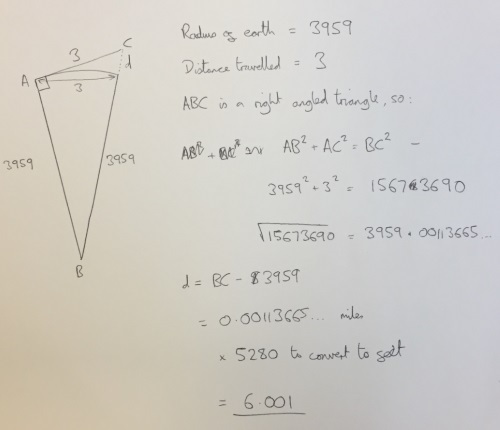 And I forgot to state that the 3959.00113... = BC, but it does because of Pythagorus. So it is about 6 feet. You are rationalizing. You don't know what the writing process was. You don't know who was involved, or how they reached that figure. You don't know if it was pulled from the calculator, or if the pilot reported one number and the producers asked for a different one, or if the real figure was actually 24 feet. The first experiment we've covered in some detail. The difference of 6 feet is borne out by a round earth, I've done the maths now and 6 feet is correct, see previous post. This really is not a matter of belief, it's a matter of geometry. I and Stagirl have also explained why how much of the boat the laser can "see" is different from the height difference in where the laser hits the boat at the two distances if the laser starts parallel to the ground and the earth curves away. I have proven that laser height cancels out and doesn't change this difference. You really have no valid objection to the first experiment. The second one. Honestly, I think the objection here may be more valid. I do think there is a possibility they have over-stated the height of the helicopter when he could see it, although I don't know whether the altimeter measures from the bottom of the helicopter and refraction may be a factor here. There is admittedly some doubt and I agree the value being exactly 24 feet is suspicious. BUT...the fact is you CAN clearly see the helicopter disappear below a "hill" of water and then rise from behind it. There is no other explanation for this other than the water bulges because of the curve of the earth. You attempted to explain this by the sinking ship effect or refraction but as someone else pointed out the former is an alleged effect when a ship is going away from you, not when something is dropping on the Y axis. And refraction would make things appear higher, not hide them. You claim in your Bishop experiment that over a 20 mile expanse you can see people playing on the beach yet have provided no evidence. Here we have on video over 6 miles a whole helicopter is occluded by the bulge of the lake as it follows the earth's curve. All you can really do is grow this slight seed of suspicion about the exact height of the helicopter into a full blown conspiracy about how the makers of the programme are lying about this for...reasons. I guess anything other than modify your beliefs, eh? Lol, thank you once again, AllAround, for demonstrating that Tom, like the rest of flerfers, struggles with diagrams and math. 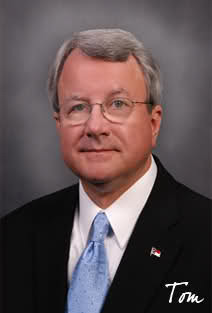 C’mon Tom, it’s embrarrasing - if you’re really as old as your picture suggests, it’s time to learn this stuff. Lol, thank you once again, AllAround, for demonstrating that Tom, like the rest of flerfers, struggles with diagrams and math. AllAround doesn't even understand what is happening. His assessments, accusations, and conclusions on this forum are generally amateur and a big waste of my time. When pretty much everyone else can see who the confused one is in this thread. He's spent the whole thread flailing around and misunderstanding pretty much everything and changing his argument as each of his objections have been destroyed. He starts by standing behind Jerad's objections even though none of them stand up to any scrutiny. He pretty much ignores all my analysis apart from going on to heroically misunderstand my proof about the laser height difference. They view from your red line and say that it reached a point where it should be if it originated from zero altitude. This is wrong in RET, and shows fraud. Which is just a flat out lie, they absolutely don't say that in the video. I don't believe that the boat would be angled away by the curvature of the earth enough to cause that effect. As though geometry and maths is a belief system. So I've done the calculations for him which show that a difference of 6 feet is exactly what you'd expect and what was measured. I note he hasn't retracted his assertion that the experiment is fraudulent even though he now has no basis for that claim or that it's me who "doesn't even understand what is happening". Trouble is, Tom has to believe this experiment is fraudulent or wrong in some way because if he accepts it then he has to accept that the earth is round, and he refuses to budge on that. His last hope is that maybe the helicopter wasn't as high as they claimed but even if that is true it still doesn't explain why the helicopter disappeared behind the horizon, there is no flat earth explanation for that. He made a couple of half-hearted attempts to but it was explained why those explanations really don't work. So he's just left with shouting "PANTS ON FIRE!" with no basis and running away. Yea, I lol’ed at the "waste of time"! The FE hypothesis is the biggest waste of time imaginable. The only reason I’m participating in this debate is to find simple and indisputable arguments that would make it easier for others to see this silly "theory" for what it is. I live in this city by the way, and drove by all the buildings hidden from view by Earth’s curvature in this photo just this morning. I assure, they’re still standing. Why are they missing from this picture, Tom?